It's a 2003 Sylvan 2100 ProFish. The guy that owned it prior flyfished for striper, so he basically never used the top and it sat in his garage. I was going to have some side curtains made but have been thrown by the costs. 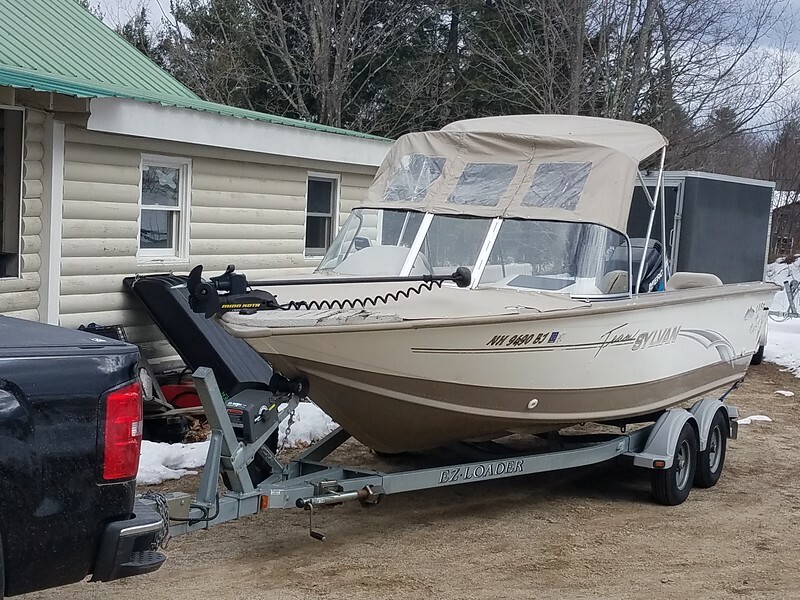 Although coming from my open 14' Starcraft, this full wraparound windshield, deep gunwales and the fishermans top is unreal for weather protection. Very nice! Yeah...we had a full canvas made for our first boat 19’ bowrider and it was $2k and we already had the bimini! You have the bimini top down to the windshield already...seems as though the sides wouldn’t be that costly. I had a small, independent canvas guy in Weare look at it, looked like a good shop. Was going to be approx. $300 per side panel and $700 for the rear curtains. I was more focused on buying the kicker and getting the riggers all set up at the time so I put it off. But those side curtains would be nice. That sounds a bit high. I would try some of the bigger shops around the lakes region. Bev at Village Canvas in Meredith was easy to work with and did nice work. Perhaps he could give a ballpark price from a picture over the phone. Worth a try! Anyway, that’s a nice boat! Good luck with it!